A document obtained by The Bay State Examiner shows that a small number of Massachusetts State Police troopers receive a disproportionately high number of complaints compared to others. The document, which was obtained by making a public records request, lists the number of formal complaints made against each state trooper from October 2010 until near the end of September 2014, covering approximately four years of data. The document shows that the majority of state troopers never received any complaints during this period. Only 583 of the 2196 currently employed troopers – about 26.55% – received any complaints. Of the state troopers who did receive complaints, 368 of them – the majority – received only one. 120 troopers received two complaints and 46 received three. A small group of 49 state troopers received four or more complaints during this period – an average of one or more per year. This group of officers received nearly 25% of the complaints, but makes up only about 2.23% of the department. Howard Friedman, a Boston civil rights attorney who specializes in police misconduct litigation, also wasn't surprised by the data. “In almost every police department, there's a small group of police officers that attract the largest number of complaints,” he said. The four years of data provided to The Bay State Examiner show that Walter Baptiste received the highest number of complaints during this period. Baptiste received a total of nine complaints – an average of more than two per year. Two troopers, Mark D. Augusta and Christopher M. Brown, received eight complaints each – an average of two per year. Two troopers, John B. Arone and Matthew B. Conway, received seven complaints each. Seven troopers received six complaints each year. 12 received five. 25 received four. Sergeant Kevin D. Emmett, who received four complaints in the past four years, was one of several state troopers named in the wrongful death lawsuit filed by the family of Kenneth Howe, the man who was killed by police at a sobriety checkpoint in 2009. Howe's family received a $1.6 million settlement from taxpayers, but none of the three law enforcement agencies involved in the death admitted wrongdoing. Emmett and the other state troopers involved in Howe's death did not face any disciplinary action. The State Police told Wolfe they “sustained” his complaint, but did not tell him what disciplinary action Brown would face. In a follow-up letter, Wolfe chastised the State Police for not seeking criminal charges against Brown. “He not only violated departmental rules and regulations, he violated assorted laws but the biggest one was a felony. He used the color of law to threaten me with arrest,” Wolfe wrote. Trooper John W. Connell, who received six complaints in the past four years, received another complaint earlier in 2010. Richard Canha said Connell nearly slammed into the back of his car while speeding down Interstate 195 without his siren on. Canha said Connell pulled him over, screamed and cursed at him in front of his three children, and gave him a wrongful $400 citation. Canha said when he went to the Dartmouth State Police barracks to make his complaint, Connell confronted him in the lobby and screamed and cursed at him again in front of other state troopers. Trooper Daniel R. Gale, who received four complaints in the past four years, became the subject of a federal investigation in 2011 after allegedly receiving illegal steroids in the mail. Gale was a sergeant at the time and has since been reduced to a trooper, but it is unclear if this was related to the steroid investigation. Trooper Jason M. Willard, who received five complaints in the past four years, currently faces three counts of indecent assault and battery on a person 14 or older and two counts of open and gross lewdness over several alleged incidents involving his estranged wife's niece. The Telegram & Gazette reported last year on Willard's history of complaints. The Telegram stated that Willard had received a total of eight complaints throughout his career, including one related to the alleged incidents he has been charged over. According to the Telegram, “five drivers pulled over by Trooper Willard in different parts of the state at different times during his decade in uniform described him as a bully whose demeanor was angry and aggressive during traffic stops. A neighbor in Auburn made a similar allegation about his demeanor after an encounter with Trooper Willard outside his home. A seventh complaint involved money that allegedly disappeared from a gun case that had been confiscated.” None of the complaints were sustained. The Bay State Examiner had initially sought data on complaints for all years. Glenn M. Rooney, an attorney with the State Police, did not reveal that the department would only be providing four years of data until weeks after collecting $200 in fees. Rooney cited an issue with the software the State Police use to track complaints. “The legacy data, or data that existed prior to the implementation of the Department’s current software, is indeterminate for statistical purposes. Meaning, while the legacy data has been entered into the Department’s current operational software, this data is not cataloged in a manner that factors into the statistical algorithm used to produce the attached records. As such, it cannot be easily differentiated for the purpose of aggregating complaint data. Collection of data prior to the implementation of the currently used software would require an extensive and time-consuming attempt to locate and hand-search any archived records that might be available,” Rooney said. Howard Friedman said that while not all complaints are valid, it's typically a sign of a genuine problem when a police officer receives a disproportionately high number. He said it's rare for people to make false complaints against police officers. Friedman said that it's important for police departments to take complaints seriously, because police officers typically do not have direct oversight from their supervisors. “Police officers work typically outside the visual sight and sound of their supervisors, so the only way to know how they're doing when they're out on the road is to get feedback,” he said. Friedman said that if supervisors do not address frequent complaints against an officer, they may be subject to liability in a civil suit. While an individual police officer having a high number of complaints compared to his or her co-workers is usually a sign of a problem, the meaning of a police department having a high number of complaints as compared to other departments is more ambiguous. According to data provided by the State Police, 407 complaints were filed against state troopers in 2011, 318 in 2012, and 244 in 2013. It is difficult to say what, if anything, these numbers mean. Due to a lack of research on the subject, it's not clear whether the number of complaints the State Police department receives is higher or lower than average for a police department of its size. It's also not clear what having a high or or low number of complaints means. An above average number of complaints could be a sign of problems, but it also might be a signal that a department takes complaints seriously and that people feel comfortable making them. A Bureau of Justice Statistics study of use of force complaints notes, “Differences in how agencies receive, process, and record complaints can account for differences in the volume and rate of complaints across agencies. Likewise, the citizen’s decision whether to file a complaint may be influenced by both citizen and agency characteristics, and other factors.” For example, the study found that departments with citizen review boards received more complaints on average than departments that didn't. A below average number of complaints might mean a police department has fewer problems, but it could also indicate that the process of making a complaint is too complicated or that complaints aren't taken seriously. A Bureau of Justice Statistics study found that the majority of people who felt that police improperly used or threatened to use force did not file formal complaints. The State Police accept written complaints in a variety of ways – in person or by mail, email, and fax – which should make it easy to file them, however, the department does not have a citizen review board or independent oversight body. Complainants are investigated internally by members of the department. According to David Procopio, “Complaints include those that are filed by members of the public as well as those that the department initiates itself. Those complaints that are less serious are generally sent to the troop of jurisdiction where the subject of the complaint is assigned with a directive that the troop headquarters conduct an investigation. Complaints that are serious in nature are investigated by the Internal Affairs Section, which is part of the Division of Standards in Training. “The findings of the internal investigation are reviewed by troopers of command rank, and ultimately by the commander of the division, who holds the rank of lieutenant colonel (the third-highest rank in the department). The Division of Standards and Training then either signs off on the investigation or sends it back for further review if deemed necessary. If an allegation of misconduct against a state trooper is sustained, the trooper has the option to appeal any disciplinary action three times, which can take years to resolve. How seriously do the State Police take the issue of misconduct? David Procopio said that the State Police have an excellent track record when it comes to investigating possible misconduct by state troopers, but Howard Friedman disagreed. “The State Police are known for not disciplining officers,” Friedman said. Colonel Timothy Alben, the head of the State Police, said during a Fox 25 interview earlier this year that it can often be difficult for investigators to prove that a state trooper engaged in misconduct. It is clear, however, that the State Police could be doing more to ensure they have the evidence necessary to prove allegations of misconduct. While many police departments around the country are talking about outfitting their officers with body cameras, the State Police still haven't adopted the decades-old technology of cruiser cameras. Such cameras are used by police departments across the country to record traffic stops and are relatively common. According to the Bureau of Justice Statistics, about 61% of local police departments and 67% of sheriff's departments used cruiser cameras in 2007. Cruiser cameras and body cameras provide investigators with objective evidence, often making the credibility issues Alben mentioned irrelevant. David Procopio said that the State Police do not currently have any plans to adopt cruiser cameras or body cameras. “In the past cameras have proven to be cost-prohibitive. As with many public agencies, allocation of limited resources demands that we prioritize how we spend our funding,” Procopio said. Alben recently spoke to WBZ about body cameras, saying that the “competing few dollars out there for equipment and training” made it unlikely the State Police would adopt the technology. Procopio said that despite not outfitting state troopers or their cruisers with cameras, the State Police have still been able to investigate misconduct. “[T]he Massachusetts State Police have a strong record of investigating our own members when they have been accused of misconduct or criminal behavior. That willingness to do so is what is most important, more important, even, than technology,” Procopio said. The State Police have shown, however, that they are not always eager to investigate troopers accused of misconduct or criminal behavior. Despite telling Fox 25 that the State Police “devote a lot of time to trying to get witnesses to cooperate with us in these cases,” Alben has personally shown an unwillingness to investigate possible misconduct in a proactive manner. Twice in the past year, The Bay State Examiner has contacted Alben about videos appearing to show police misconduct. In each case, Alben refused to open an investigation until a formal complaint was made by the alleged victim. In the first case, the incident was partially captured on video, but Alben said State Police couldn't investigate without a statement from the alleged victim because some of the incident happened off camera. The alleged victim told The Bay State Examiner that the State Police never reached out to him to ask if he wanted to make a statement. In the second case, the entire incident was captured on video, but Alben still refused to investigate it or even release the name of the state trooper who was involved. Howard Friedman said it's wrong for police to refuse to open an investigation when possible misconduct is brought to their attention. 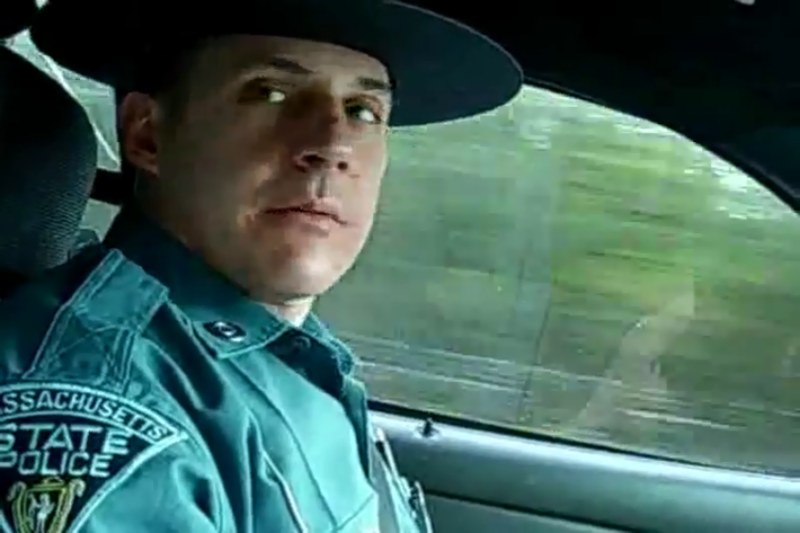 How transparent are the State Police about misconduct? While the records provided to The Bay State Examiner show how many complaints each state trooper has received in the past four years, a great deal of important information about the complaints is still unknown. For example, it is unclear how many were citizen complaints and how many originated from within the department. It is also unclear how serious the allegations in each complaint were and what the outcome of each case was. Some of the gaps in information could be filled if the State Police produced periodic reports with statistical information about complaints, like the Boston Police Department's citizen review board has been doing over the past several years. Glenn Rooney confirmed earlier this year that the State Police do not produce any such reports. The information could also be gleaned from the State Police's internal affairs records, but obtaining copies of every state trooper's file would likely be cost prohibitive. Thomas Caywood, a reporter for the Telegram & Gazette, said the paper paid $600 for a copy of Jason Willard's internal affairs file. The Bay State Examiner was charged $200 for a copy of Trooper Kenneth C. Harold's internal affairs file earlier this year. Rooney told The Bay State Examiner that even providing a fee estimate for every internal affairs file "would require substantial Department resources." He said the files are paper records and that an employee would have to locate each file and count the number of pages by hand before estimating the cost. It is likely the State Police would charge tens or even hundreds of thousands of dollars for copies of every file. When the State Police provide internal affairs records to the public, they tend to be redacted heavily, with page after page containing little or no information. State Police say the extensive redactions are necessary to protect the privacy of complainants who may be reluctant to come forward if their identities are made public. Alben told Fox 25 that he would support revising the public records law so that the State Police could release more information, but doing so would not be necessary to open up much of the what they currently keep from the public. The State Police black out more than just names, addresses, telephone numbers, and other personally identifying information. They redact entire witness statements and interview transcripts. They redact not only statements made by citizen witnesses, but also those made by the state troopers who are being investigated. This presents a problem, because the way investigators interview witnesses during misconduct investigations demonstrates whether or not they take the investigations seriously. Howard Friedman said that police officers who investigate complaints often ask police easy or leading questions, but “cross-examine” complainants and attempt to undermine their credibility. When Harold Wolfe made a complaint in 2010, he attempted to record his interview, but the lieutenant assigned to investigate refused to speak with him unless he shut his recording device off. Wolfe said that after he turned his recorder off, the lieutenant asked him inappropriate and irrelevant questions such as whether he took drugs, how many times he had been arrested, and whether he had ever been treated for mental illness. “The goal of all the questions was merely to demean, demonize and marginalize anyone who dares to complain against the state police,” Wolfe wrote on his website. In the past, the State Police have tried to get away with refusing to release internal affairs records to the public in their entirety. Mike Beaudet, a reporter for Fox 25, said during a broadcast earlier this year that he had to fight with the State Police for two years to get copies of the internal affairs files for several ex-state troopers. Beaudet later told The Bay State Examiner that the State Police initially would not release any of the records at all. Nearly a decade prior, the case Worcester Telegram & Gazette Corporation v. Chief of Police of Worcester had already set the precedent that these documents are public records. Beaudet said he appealed the decision to the Supervisor of Records, who told the State Police to turn over the documents. Beaudet then fought with the State Police over the cost of providing the records before finally getting them. Judge Joseph Grasso, the Massachusetts judge who ruled that internal affairs documents are public records, wrote that “A citizenry's full and fair assessment of a police department's internal investigation of its officer's actions promotes the core value of trust between citizens and police essential to law enforcement and the protection of constitutional rights.” As it stands, a “full and fair assessment” of the State Police's internal investigations isn't a possibility.